IFBB Hall of Fame Professional Bodybuilder Flex Wheeler believes that his willingness to be vulnerable and openly share his struggles with the world is sometimes a weakness. However, that didn’t hold him back from telling his compelling life story during this podcast. 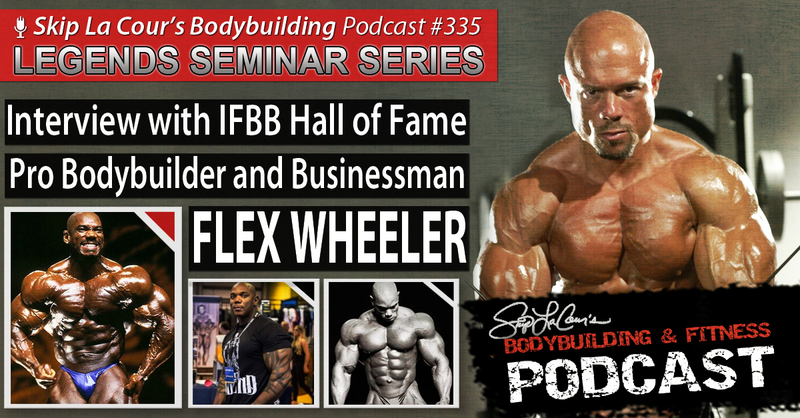 Flex talks about some of the very best contest appearances, events and feelings that he experienced as a bodybuilder–and what he’s doing these days as a driven businessman. Wheeler explains why he feels that the camaraderie, connection, and competitiveness among the Gold’s Gym Venice bodybuilders of the 90s made a much tighter group than the legendary closeness among Arnold Schwarzenegger and the “Pumping Iron” crew back in the 70s. He also reveals who was the real leader of the 90s bodybuilding stars back then. His answer will surprise you. The bodybuilding legend discusses the challenges he had growing up dealing with the childhood trauma of sexual abuse and low self esteem. He also talks about the suicidal thoughts that’s he’s battled most of his life and how they have only subsided a little over a decade ago. Not only does he talk in depth about his kidney transplant and the serious health issues that continue to threaten his life, he reveals what really bothers him about what the public thinks about his medical condition. Flex doesn’t hold back one bit as he tells you what he really thinks about the new breed of YouTube Fitness superstars like C.T. Fletcher, Mike Rashid, and the others (his beliefs about this may surprise you too). The four-time Arnold Classic champion tells you why family is the most important thing to him and describes the type of people he makes sure he spends the majority of his time with these days. Visit Flex Wheeler’s website at www.TeamFlexWheeler.com. You can visit him on YouTube too at www.youtube.com/theofficialflexwheeler.